Please select a valid rating. A main-dish salad using ingredients you have on hand. 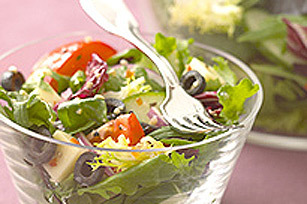 TOSS the first six ingredients in a large salad bowl. POUR dressing over and toss lightly. Serve immediately. Easy and delicious recipes right to your inbox.